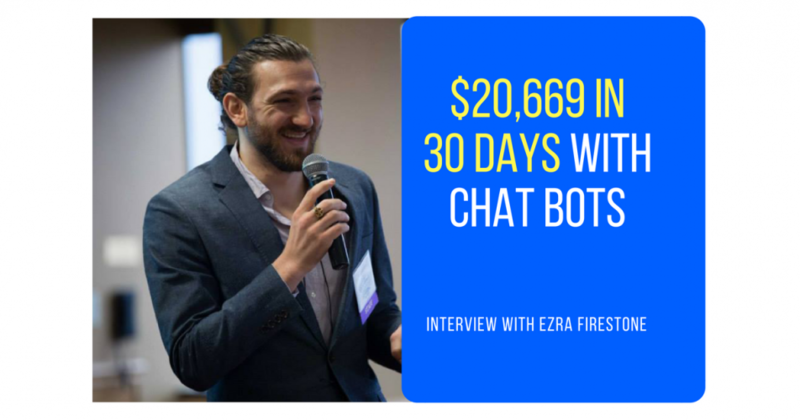 Ezra Firestone generated $20,669 in only 30 days with Messenger Chatbots for his business, SmartMarketer.com. This number isn’t a million dollars but this new marketing channel quickly became Ezra’s new obsession and he believes in the future, Messenger Marketing will definitely be one of his top 3-5 channels to generate revenue. This video is the first part of a five part series where Ezra describes the context on how he does marketing. The next four parts dives deep into actionable tactics on how to implement Messenger chatbots into your marketing strategy. This interviewed is packed with amazing nuggets throughout and if you are new to messenger marketing, you are going to generate so many ideas after watching this. So stop reading now… and please enjoy this wonderful interview with Ezra Firestone! Get access to the bonus Q&A with Ezra Firestone where he shares more actionable advice for Bot Academy graduates.